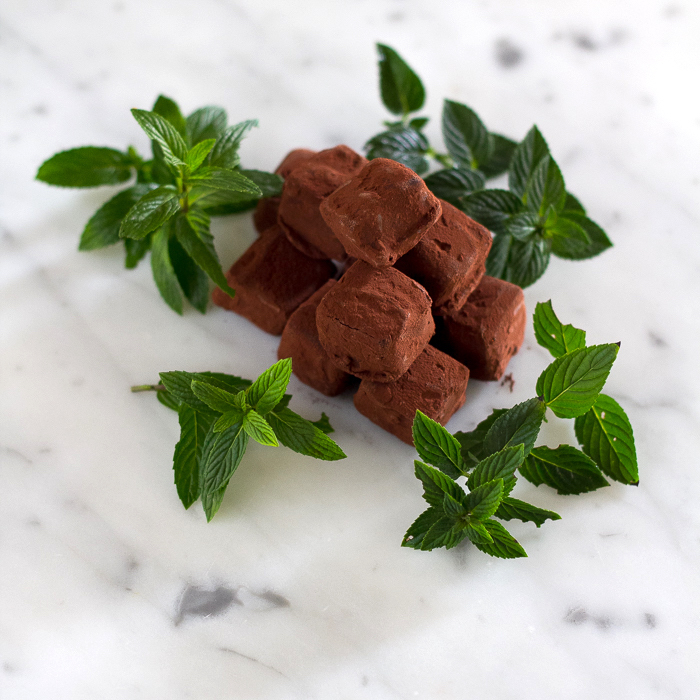 These mint truffles have a fresh minty flavour that contrasts beautifully with the creamy and intense 70% dark chocolate ganache. Made with an infusion of peppermint and spearmint leaves, freshly picked from our kitchen garden, for a true mint flavour. No extracts or flavouring oils in sight. Packaged in a clear cellophane bag with our logo. Ingredients: sugar, cocoa beans, cocoa butter, cream, butter, invert sugar, cocoa powder, infusion of fresh peppermint and spearmint leaves, emulsifier (soya lecithin), natural vanilla extract. Allergy Information: Contains dairy. May contain traces of nuts, egg proteins, and gluten. Store in a cool, dry place, between 16-18°C.